I love tote bags. Almost as much as I love school supplies. Last year, I posted about what I put in my teacher bag and included a picture of it. 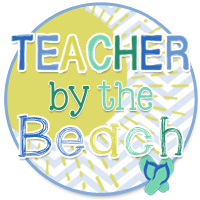 Today, while I was reading blog posts, I came across this fun linky that Teacher by the Beach is hosting. She just bought a new teacher tote and wrote a blog post about it. 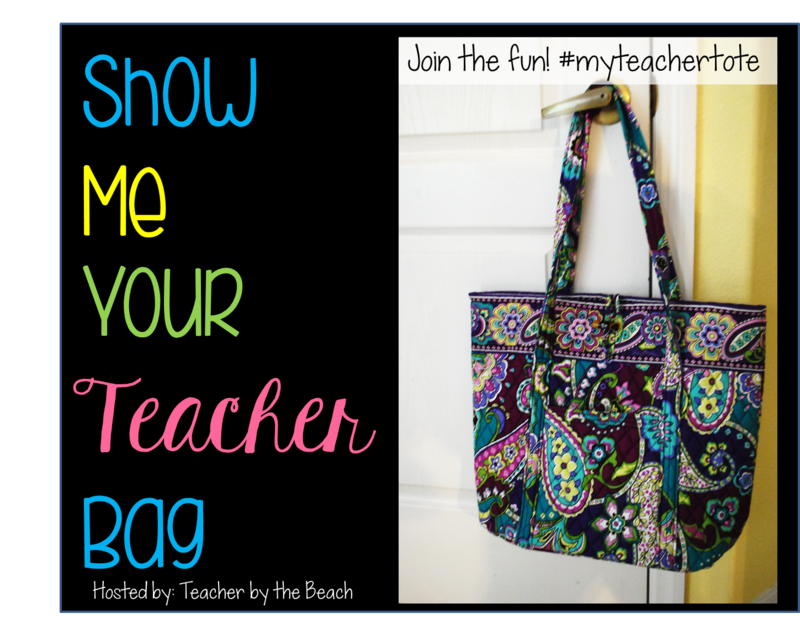 What a perfect time to show you my new teacher tote too! At the end of the school year, I finally decided to retire my old-$15-Walmart bag (see it here) and bought my very first Thirty-One tote. Oh. My. Goodness. I absolutely love it. I received it the night before the last day of school, so I haven't really used it much yet. However, I can tell that this will be a beautiful relationship. I was a bit cautious about buying this bag. I have a hard time buying something online when I haven't seen it in person first and I thought it was a tad expensive. After all, I only spent $15 on my last bag and it lasted a few years. 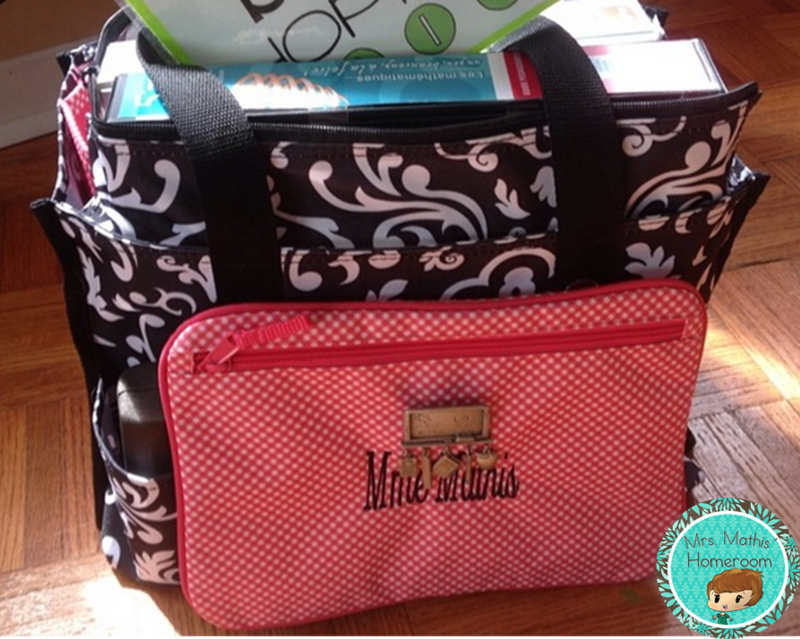 In June, I went to a conference and more than half the teachers there had the Thirty-One Deluxe Utility Tote. I fell in love with it right away and just had to order one for myself. I also bought two pockets for each side of my bag and had one embroidered with my name (that cute little teacher pin was a birthday gift from my daughter!). The best part with these pockets is that they can easily be removed! I use one as a pencial case and the other for all of my little electronic devices and USB sticks. The final touch is the insert that helps me keep everything organized in there. Love! I might have to buy more than one bag! Shhhhh....don't tell my hubby! Your turn! What do you use as a teacher bag? Show us your teacher tote! This is the same print as mine! Love it! I haven't seen this type of bag though! I'll have to check it out! You are going to love it! i have a utility tote that i also use :) Thanks for linking up! LOL...I have the exact same one as my teacher bag! Found you through Teacher Bag Linky! Thirty-One bags are the best! I love ALL of mine.